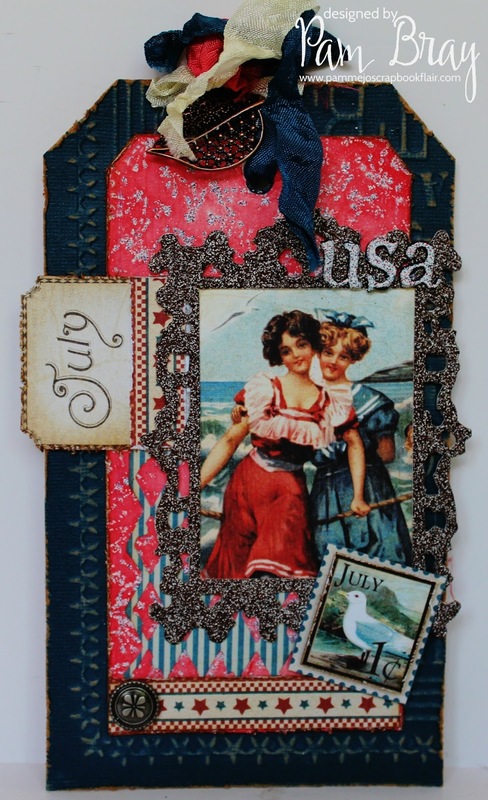 Die cut a tag using chipboard to begin your Fourth of July Tag. 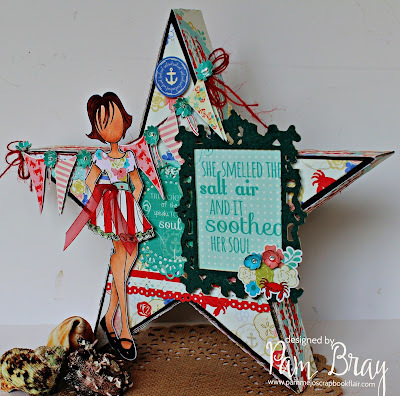 Using VersaMark along with Emerald Creek Fourth of July Embossing Powder and Stamp; s Shootin' Stars Stamp image to tag and heat emboss. Stamp and emboss the entire tag with the Fourth of July Embossing Powder and Shootin' Stars Stamp. Go over prepared tag with Barn Door Distress Ink. 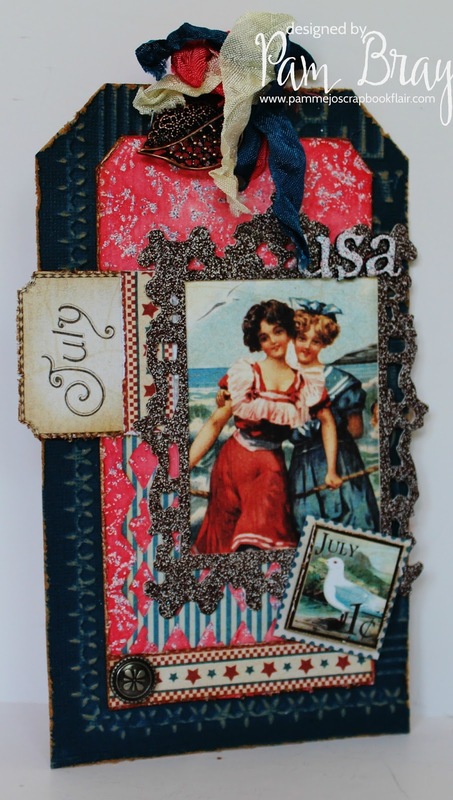 Die cut Ornate Frame from chipboard. Apply VersaMark to top of die cut frame. 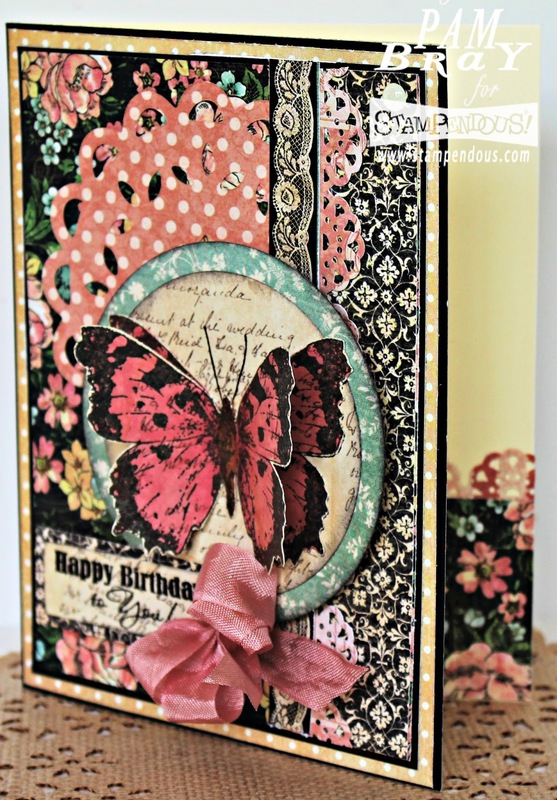 Add Aurora Embossing Powder to top. Distress edge of prepared tag with distress tool. Adhere to Core'dinations Seasonal Impressions paper that has been lightly sanded off. Add vintage image from pattern paper to back of prepared embossed frame. Die cut Mixed Media die using pattern paper. Place USA sticky Alpha letters to post a note. Press VersaMark on top of letters. 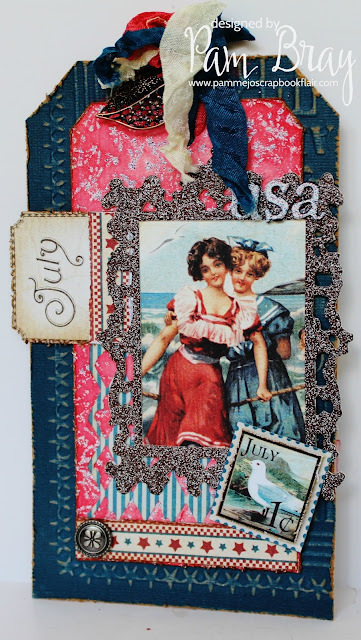 Apply Fourth of July Embossing Powder. Add pretty ribbon to the top of tag along with an Emerald Creek Filigree Leaf Charm. Adhere prepared USA letters to top of frame. Adhere "July" journal piece from pattern paper on to tag. Add Emerald Creek Flower Crest Brad to corner of tag. Adhere frame to top of prepared tag. Fussy cut stamp image from pattern paper. I hope you have a fabulous Fourth of July and join us on the Emerald Creek Dare Challenge Blog this month. Hope you are having a wonderful day celebrating "YOU". So I used Graphic 45 Ladies Diary to create your special card. 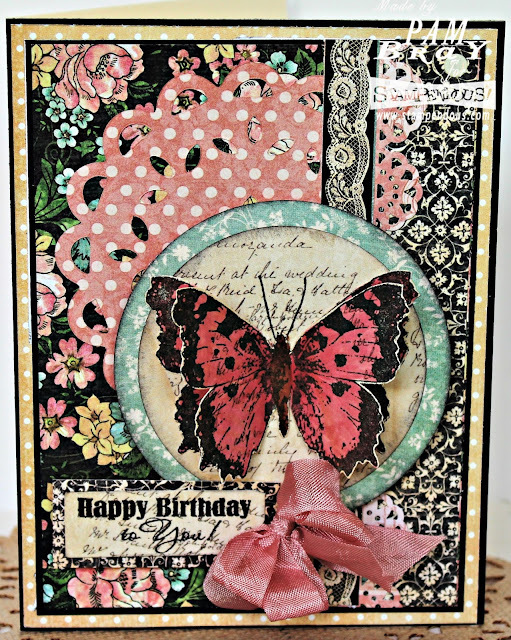 Stamped a couple of the the beautiful Stampendous butterflies and layered them together on a couple pattern paper circles. Love how the layered butterfly gives dimension. A pretty bow to finish your birthday card. And of course a lovely birthday sentiment. to help with the Stampendous Team but more in how you have helped me along the way.